The past few days have been a whirlwind of activity from immigration activists who are taking their protests and frustrations over the administration’s Secure Communities program directly to Obama campaign offices and Democratic Party headquarters around the country. “Civil and immigrant rights activists demonstrated Tuesday outside the state Democratic Party’s headquarters in Atlanta, calling on the Obama administration to scrap a federal fingerprint-sharing program aimed at deporting illegal immigrants. The demonstrators complained the “Secure Communities” program is tearing families apart and distracting local police from other crime-fighting priorities. They timed their demonstration to coincide with protests in Chicago and other cities across the nation. These actions are in response to the over 1,000,000 immigrants being deported since President Obama took office. 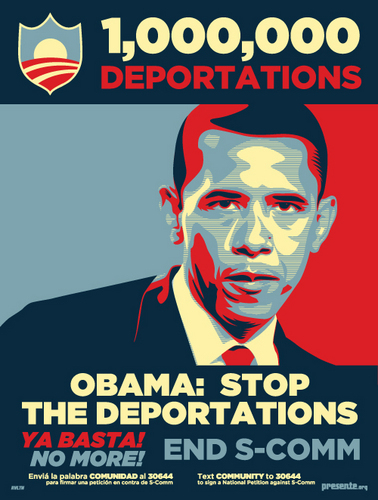 With the upcoming Presidential election and the increasingly heated rhetoric coming from the GOP contenders on immigration (see Rick Perry’s drone statement), activists are taking the opportunity to really push the President to use some of the tools he already has to ease the deportation situation. Already the White House is responding to these actions with Cecilia Muñoz, the Director of Intergovernmental Affairs, writing this blog defending the Secure Communities program. And predictably, some in the community are calling for Muñoz to resign her position. That Muñoz is being dispatched to respond this week about Secure Communities shows that the White House is paying close attention. Unless some changes are made, the calls for resignations, petition signing, and protests will continue. What are your thoughts? Should Latinos working in the White House resign over this issue or should they continue to defend the administration’s position? By all means Latinos working in the White House should resign over this issue! But really now,do you really expect they have the courage to do that? It’s great to see Latinos doing something,breathing some new life around this issue,bringing it to a greater national prominence and attention. It is sickening to me though to realize the very real possibility of these very same activists jumping from protesting draconian Obama administrations policies to supporting and campaigning for Obama re-election in 2012. No wonder Obama,the Democratic Party and the DNC don’t take Latinos serious at all.In their minds Latinos are to be lied to,manipulated and deceived at election time then sent back to the plantation and ignored until the next election. The most obvious electoral weapon which Latinos have at their disposal is the one Latinos will not even consider yet less use.That is to NOT vote for Obama. But you can bet Obama’s Latino establishment pendejos and flunkies will come out full force shoving even more overripe rotten Obama “Hope and Change” down Latinos throats. Thats why Obama isn’t worried at all about the Latino vote.He already has them eating out of the palms of his hands..
refuse to be snookered again by Obama & Co. and to hear them tell him loud and clear.. I think what needs to be pointed out is that because of Secure Communities American citizens are being detained and in some cases deported. The government DOES NOT have the right to do that to US citizens! This program was started under Bush I have read. My problem with this blaming Obama is that if this is supposed to target illegal immigrants who engage in criminal activity, then those who round up these immigrants should do just that and leave law abiding immigrants alone. I seriously doubt that President Obama has any direct dealings with how local law officials do their job. There is always abuse it seems in law enforcement even when it shouldn’t be. Why is the focus on the president and not those who are supposed to be doing their job to rid the country of illegal aliens who commit crimes? Maybe the protesting should start there. Just saying! This is directed to Anna. US Citizens are not being deported because of Secure Communities. Get real. If a US Citizen is deported, which is rare it is because they have claimed to be illegal aliens in an efforts to get out of being prosecuted for the crime they were arrested for. Illegal aliens need to stop tearing their families apart by returning to their own country. I do not think that Latinos working in the White House should resign over this issue. Instead, they should publicly state that they do not agree with it each and every time that they enforce it. This would be free PR regarding how Latinos in the US government feel about this issue. That way Obama can’t point to them as evidence that the Latino community is supporting his immigration policy. Yea,good idea,they should do that too! After hitting a record 1 MILLION deportations, the Obama administration just did the unthinkable: Forcing states and police departments to comply with a controversial program called Secure Communities or S-Comm – a move guaranteed to deport many more millions of people. S-Comm is a highly criticized federal program that is deporting immigrants who have done nothing wrong, encouraging racial profiling, devastating communities around the country, and making us all less safe. In fact, under S-Comm authorities can deport a woman reporting domestic violence, instead of protecting her. Huge immigrant states like Illinois and New York opted out of the program because it breeds distrust of the police – and now President Obama is forcing them to comply. Obama’s decision to force all localities to enroll in Secure Communities (S-Comm) is anti-democratic, and will further devastate our communities by placing innocent immigrants in deportation and breaking trust between police and immigrants. We demand that you terminate the S-Comm program immediately! Under the Obama Administration, ICE and DHS have gone out of their way to mislead the public about Secure Communities.And despite rhetoric about supporting fair immigration reform and relief for our communities, their actions are speaking much louder than their words. Now they are poised to force local officials to make this situation even worse. Until recently, the Obama Administration used to sign agreements with states, cities, and towns regarding whether or not these localities wanted to enroll in S-Comm. But when local governments started to say they didn’t want the program, the Obama administration changed their own rules. Last Friday, they ended agreements with 42 states, claiming that local permission wasn’t needed to force every local police department into the program by 2013.
sara u.s. citizens have been deported. You just don’t hear of it because the media doesn’t care to cover it. You only hear of it in other none english speaking media. I have seen a few cases and they don’t even get an apolligy. Gosh, you’re really informed and very convincing. Dumbass. You’re assuming they know how to think for themselves. You posted this article on the 17th of August. The next day on the 18th the Obama administration raised the white flag and made the largest immigration policy change since 1986. As I indicated on CNN Espanol on Friday, this is a ploy to do two thing. First, get Latino’s of their backs (or HQ OFFICES) and second to get Republicans to denounce the new policy so Obama can point and say “See they hate you, vote for me in 2012″ My problem stems from a constitutional point of view and a political point of view. Constitutional because I think the president had it right, he can not do this. At least not to the way they are advertising the new policy will work. Political becuase if the policy get’s attacked or even overturned, he can say see I tried but they stopped me. Latinos once have become pawns in the chess board game of re-election politics. In today’s Washington Post, it shows Obama has been calling in Latino leaders to give them their talking points to take back to the community. Not sure how many will carry water for him again. I was a county delegate for him and maxed out my contributions in the primary and general in 2008. But this time, he doesn’t get a dime. In fact, I’ve already started giving money to Huntsman, and I’m really left-wing. Payback is a motha, my brotha. their personal interests (their job) over Latino interests. But for now, they are all we have – let us hope that they stand up for us soon. No Irma, people need to stand up for themselves, not wait for some paid off hacks to see the light. People who lie for a living will never do what’s right. They’re only motivated by fear of losing the election and all the perks that go with holding office and/or working in the White House.